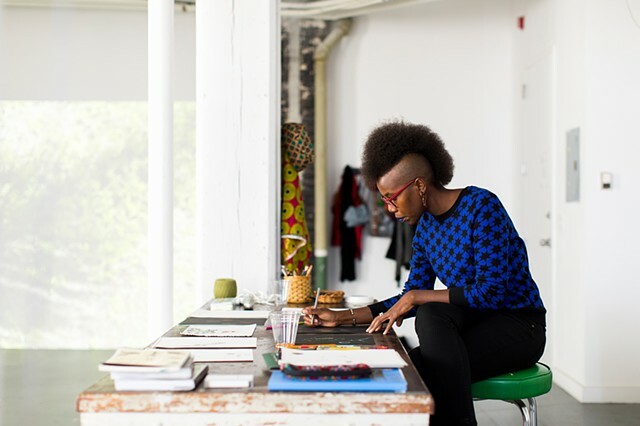 Miatta Kawinzi is a multi-disciplinary artist. She explores the figure, the inner & outer landscape, and culture as sites of re-imagination & possibility. She works with images, objects, sound, space, the body, and language. She was born in 1987 in Nashville, TN to a Liberian mother and Kenyan father. Based in NYC, she has exhibited and/or performed her work in the US, Mexico, South Africa, France, Switzerland, Trinidad & Tobago, and Liberia, and her work is included in the Art-in-Embassies public collection in Monrovia, Liberia, in an Art Connects NY public collection in Queens, NY, and in private collections. She received a BA in Interdisciplinary Art & Cultural Theory from Hampshire College in 2010 and an MFA in Studio Art from Hunter College in 2016. She has been awarded artist residencies at Alfred University's Institute for Electronic Arts (Alfred, NY), the Cité internationale des arts (Paris, France, with Lower Manhattan Cultural Council), the Bag Factory (Johannesburg, South Africa), the Bemis Center for Contemporary Arts (Omaha, NE), Beta-Local (San Juan, Puerto Rico), Greatmore Studios (Cape Town, South Africa), IAAB (Basel, Switzerland), Flux Factory (NYC), and the SOMA Summer program (Mexico City, Mexico). Additional awards include a NY Community Trust Foundation Fellowship, the Kossak Travel Grant, and a Foundation for Contemporary Arts Emergency Grant. Recent exhibition sites of her work include BRIC and the Studio Museum in Harlem (NY), Aljira Center for Contemporary Art (NJ), and the FNB Joburg Art Fair (SA). She has held recent teaching appointments at Hampshire College (Adjunct Assistant Professor of Art) and the University of Richmond (Adjunct Lecturer in Art). Exploring the intersections of social engagement and creative practice, Kawinzi also works as a community-based teaching artist & workshop facilitator and museum educator.